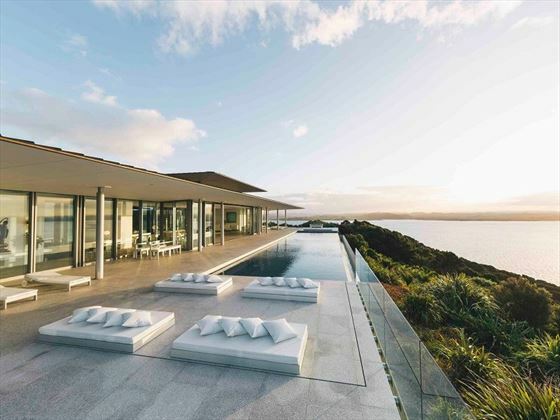 Overlooking the Bay of Islands on an unspoilt island-like peninsula, and nestled on their own private ridgeline, Eagles Nest Villas are an amazing collection of contemporary villas that really evoke a sense of exclusivity, luxury and peace. The five villas are incredibly luxurious, all perched on top of scenic hills, looking out onto the sparkling waters and luscious flora. 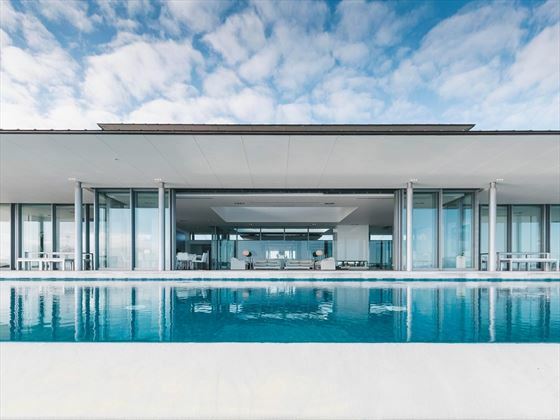 The spectacular surroundings are clearly the inspiration for these architectural masterpieces, all built to complement the bright blues of the sea, and the calm ambience these views bring. You’ll feel like the only person in the world as you lounge on your outdoor deck, or watch the sunset from your spacious living room. Each room is decorated in a clean, crisp and modern manner, adding another touch of luxury. Feel like dining on seafood caught straight from the sea? Or perhaps a decadent dish in the comfort of your dining room? Eagles Nest’s resident chefs will create a bespoke menu for you, cooking up feasts in your gourmet kitchen as you sip cocktails on the deck, or creating a hearty breakfast as you wake up from a slumber. Eagles Nest also has a resident personal trainer, and amazing spa therapists for those who simply want to unwind. 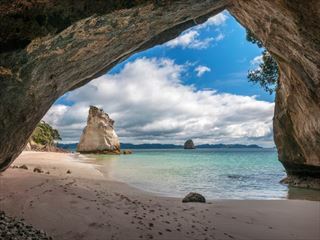 With the historic town of Russell only a short walk away, there’s ample opportunity to explore the Bay of Islands too. Tranquillity, seclusion, and the utmost luxury…we’re certain you’ll want to indulge with one of these spectacular villas. 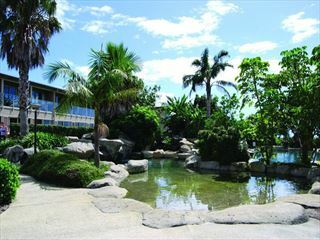 Eagles Nest is located in the Bay of Islands, nestled on a stunning island-like peninsula that leads into a valley. The villas are easy walking distance from Russell, a town full of history and charming activities. 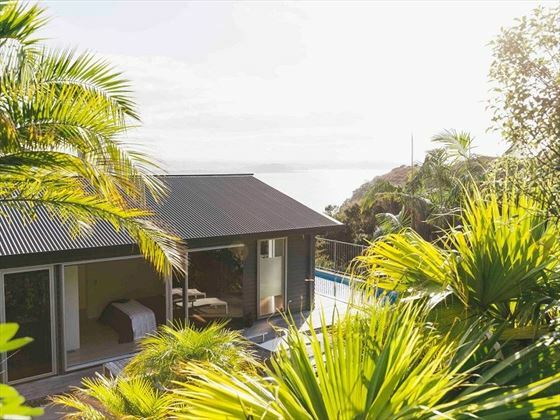 The Eyrie – Clean, sophisticated and contemporary, this stylish three-bedroom villa is perfect for families looking for a private oasis. 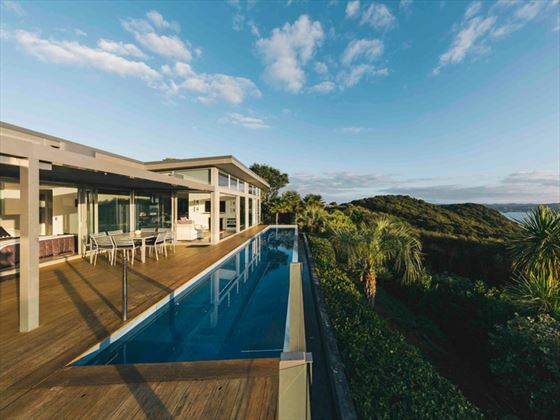 The expansive outdoor living area fit with a private pool is the ideal space for the family to enjoy each other’s company and take in the incredible landscapes together – perched high up in native bush, the villa has unforgettable views of Waitangi, Paihia and the Islands of the North. 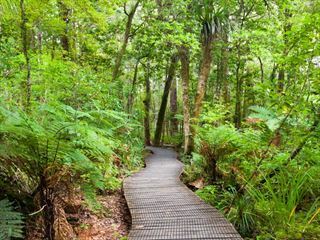 You’ll love strolling through your private courtyard – it’s teeming with gorgeous native birds. Eagle Spirit – Located in the opportune spot for sun-drenched mornings and beautiful sunsets, this three-bedroom villa is contemporary, stylish, and offers a sense of peace that will make you feel like the only people in the world. 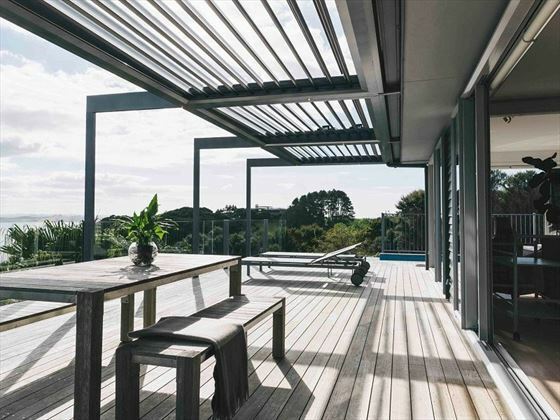 Overlooking the historical ground of Waitangi, time is best spent relaxing by your private heated outdoor infinity pool, watching dolphins play in the ocean. First Light Temple – Framed by luscious gardens full of vibrant flora and swaying palms, you’ll feel like you’ve found your own private, jungle-like paradise with this villa. Ideal for two, this is the perfect villa for an indulgent honeymoon. Featuring a mezzanine bedroom with stunning views, plus wonderful indoor and outdoor fireplaces for snuggling up and drinking cocktails together. You’ll fall in love with the balcony that spread out onto three sides of the villa – nothing could be more romantic than gazing at the stars. Sacred Space – Modern, luxurious, yet still evoking a welcoming and homely feel, Sacred Space is perfect for families or friends reconciling in the sunshine. The décor here is casual yet elegant, with lots of original artwork and antique furniture. 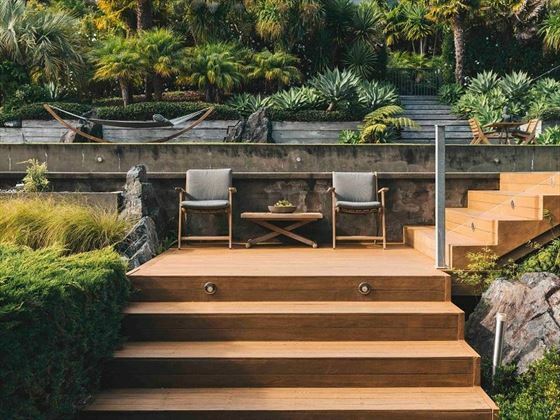 The master bedroom takes over the entire upstairs, whilst the lower floor features three more bedrooms, an open-plan kitchen, living and dining area, and an incredible outdoor space fit with a pool, spa and sauna. 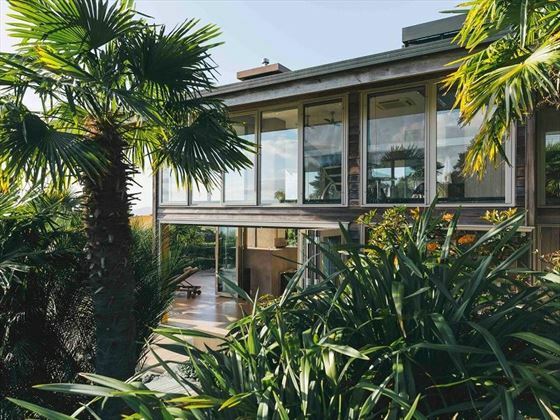 Our favourite part is the two-story glass-roofed living area, perfect for relaxing during the day, before turning it into a private movie theatre at night. 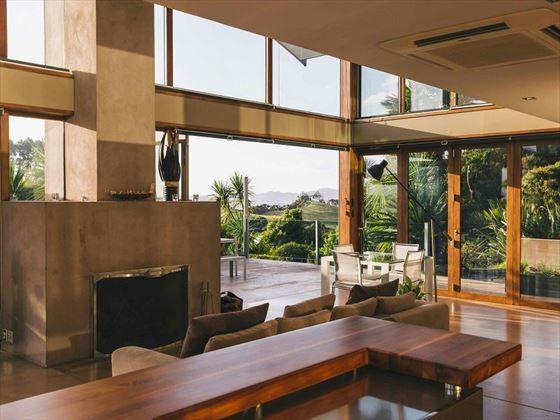 Rahimoana – Meaning ‘Sun God Over the Ocean’ in Maori translation, this incredible villa’s sliding glass walls and hilltop location make this one of the most indulgent villas in the Bay of Islands. 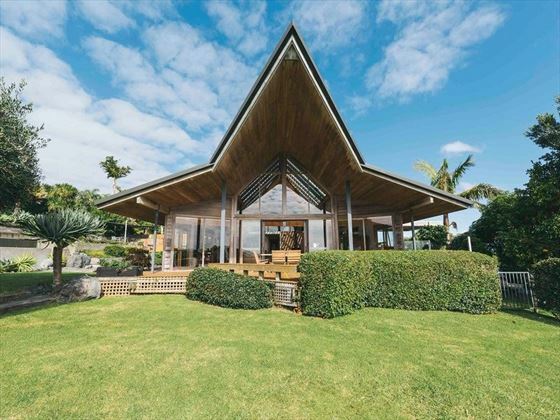 Featuring a dramatic aerofoil copper roof, an expansive outdoor deck with an infinity lap pool, four en-suite bedrooms, living and entertaining areas, a private beach, a helipad, private courtyards, a gym, sauna and a wine cellar. 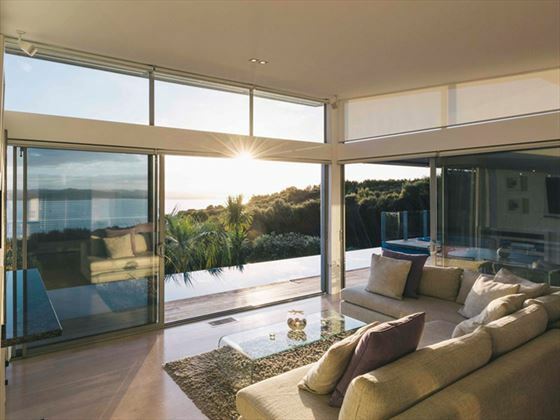 The walls made completely of glass make way for incredible views of over a kilometre of beach and gorgeous sunsets. The resort’s talented resident chefs create private, bespoke dining experiences for you to enjoy in the comfort of your own villa – and they’re personally cooked in your villa, too. Whether you fancy tucking into a decadent lamb dish in your dining room, or fresh seafood out on your private deck, you’ll always have a spectacular view. There’s also a fabulous wine cellar to indulge in, or you could of course create your own feast. 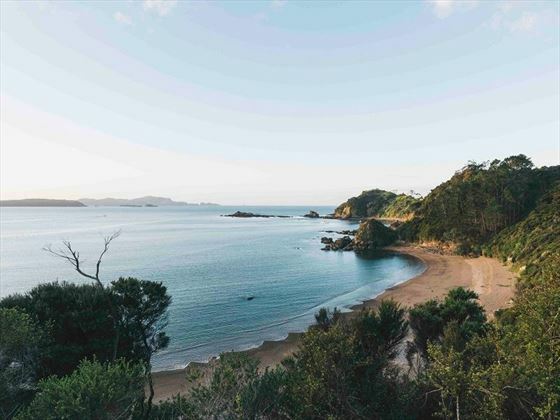 Boasting a fine position at the heart of the Bay of Islands, Copthorne Hotel is close to the Waitangi Treat Grounds and many other incredible sights.